For some of the biggest corporations in the United States, solar energy is the next big thing. Solar panels help reduce a company’s environmental footprint and are great for public image. They’ll also pay for themselves over time in the free energy they produce. That’s a great return on investment for some of the US’s largest corporations—and for these multi-billion dollar investors, solar panels make smart business sense. Commercial solar in the United States owes a lot of its growth to support from the federal government in the form of tax credits and rebates. These programs help cut the cost of solar panels and panel installation, making solar systems even more attractive as investments. The EPA’s Green Power Partnership represents over 1,300 organizations that have made a commitment to voluntary renewable energy investments. 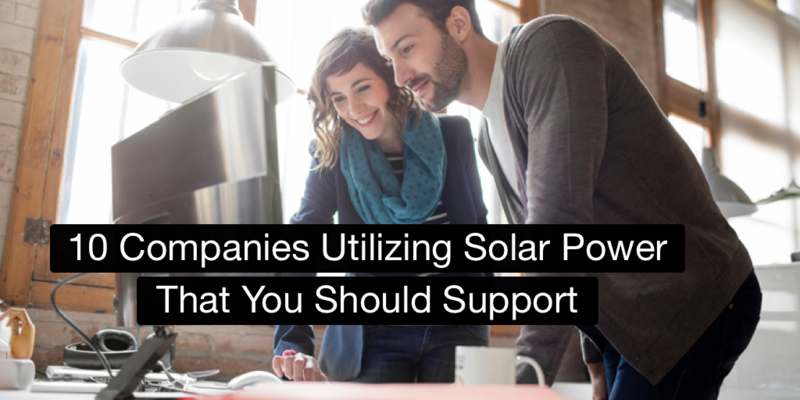 While many companies install solar panels themselves on-site, all the companies on this list also purchase renewable energy credits from grid-tied solar systems across the US. The net result is the same; the solar industry grows and carbon emissions are offset, with corporations leading the way. These companies are committed to supporting the growing renewable energy sector in the United States. You can do your part by supporting them with your business. Here are the top ten companies to watch in the solar energy sector. Solar power makes up a good deal of those green investments, too. In April 2017, the company completed work on the second-largest on-site solar carport array in the United States in Arizona. The array covers 3,200 parking spaces and is slated to offset the electricity equivalent of 1,000 US homes annually.3 The company also holds the title for the largest solar carport installation in the United States, thanks to an installation at its Folsom, California campus. 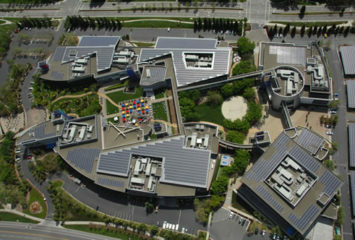 Microsoft was an early solar leader among US corporations; it installed 480 kW of solar panels on its flagship campus in the Silicon Valley in 2006.5 Now, Microsoft president Brad Smith has committed the company to increasing its solar infrastructure for data centers across the United States, making an investment in Microsoft’s business a net positive for the solar industry as well. It could be argued that Google has had a bigger impact on the US solar market than any other company on this list. Because while the company’s 1,763,588,904-kWh investment in green energy isn’t the highest in the nation,6 Google’s benefit to the solar industry in the US has a further reach in the virtual arena. Plenty of solar installers in the United States use Google Maps and the Google Earth project to remotely quote customers on their homes’ potential for solar panels. These tools have saved installers time, energy, and money by streamlining the quote process. Google SketchUp is used by many solar installers as a tool for drawing potential solar system designs over photos of a customer’s roof, helping all parties visualize the design of a solar installation. And in 2015, Google launched Project Sunroof, an algorithm that has used 3D modeling to measure the solar power potential of US buildings. For the solar industry, Google is laying the groundwork for growth and innovation. Kohl’s, one of the US’s most popular retail clothing chains, is a national leader on renewable energy commitments. The chain generates an astounding 1,430,381,349 kWh of energy with solar and wind power.7 This offsets 109% of the company’s energy use. That means solar and wind investments owned by Kohl’s produce more power than the entire store chain consumes annually. By the end of last year, Kohl’s had over 160 solar power systems in fifteen states.8 Thanks to those arrays, and combined with the solar energy credits purchased by the chain, the company will offset the electricity equivalent of 4,123 homes and reduce carbon emissions by over 45,000 tons annually. Apple remains one of the most popular companies in the world for ubiquitous products like the iPhone and iPad. Now, the California-based tech giant is moving into the renewable energy sector. Apple Energy, LLC is a subsidiary entirely devoted to selling off excess energy generated by three of its solar energy installations in six regional power markets. Apple’s recent interest in the solar energy market should come as no surprise; the company offsets 100% of its electricity with renewable energy investments,9 joining a growing number of tech companies that are offsetting huge electricity needs with green technology. So when you ask Siri for the day’s weather, there’s a good chance that her response could be generated by solar-power. Starbucks is “re-writing the rulebook for energy purchasing,” according to a Solar Industry interview with Sam Kimmins, head of RE100, the global initiative that Starbucks and other companies have joined in an effort to expand renewable infrastructure.12 This move signals a new paradigm; more and more corporations are becoming the financial drivers behind the world’s largest solar installations. Walmart is the world’s largest retail chain. In fact, Walmart’s $482 billion in revenue last year makes it a huge contender in its industry.13 By simply installing solar panels on the roofs of retail locations, the company is making a massive contribution to solar energy in the United States. Walmart offsets just 4% of its total energy use with solar power.14 However, the company’s footprint in the US is so large that this still accounts for more installed solar panels than any other corporation in the United States. In the top twenty-five commercial solar installers, Walmart represents one-sixth of all solar panels installed, and it has more solar infrastructure on the roofs of its stores than the entire residential, commercial, and municipal solar capacities of thirty-five states.15 With commitments to double this infrastructure by 2020, this company is certainly a driving force in the solar industry. IKEA is well-known for its modular furniture and delicious Swedish meatballs. But it’s also a company to watch for in terms of solar energy. 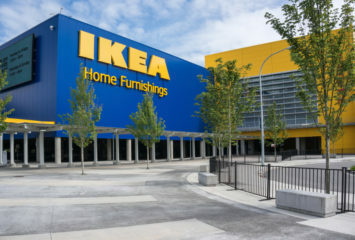 As of February 2017, Ikea offsets an astounding 317% of its total energy use with renewable energy commitments.16 That’s not a typo—IKEA produces over three times its annual energy use in green power, and a significant portion of that comes from solar energy. The chocolate company’s Henderson site in Nevada is 100% solar powered on a sunny day, drawing energy from a massive 4.4-acre solar installation on site,19 The company has a history of solar investments, too, as evidenced by the 18-acre, 28,000-panel installation in Hackettstown, New Jersey.20 Unsurprisingly, Mars chairwoman and heiress Victoria B. Mars says her favorite M&M color is green. If you’re a solar homeowner or are thinking about installing solar, you’re in good company; solar energy is one of the smartest investments you can make. The companies on this list are leading the charge towards a greener future through solar power and other renewable technologies. You can help solar power grow in the United States by giving these ten companies your business. The EPA’s list also includes hundreds of local partnerships, so see if your favorite local businesses are part of the solar power revolution.